The Ayushman Bharat (Hindi for “India blessed with a long life”) scheme is a government health insurance program that will cover about 100 million poor and vulnerable families in India providing up to INR 0.5 million per family per year for secondary and tertiary care hospitalization services. In addition, it also proposes to establish 150,000 health and wellness centers all over the country providing comprehensive primary health care. The beneficiaries of the hospital insurance scheme can avail health care services from both public and empanelled private health facilities. This scheme is one of the largest government-sponsored health insurance schemes in the world. Previous experience with government-financed health insurance schemes in India has shown that they are inequitable, inefficient, and do not provide financial protection. There is a lack of clarity on the budgetary provisions over the years when the utilization is likely to increase. The Ayushman Bharat scheme in its current form strengthens the “for profit” private health sector, requiring greater emphasis on its regulation. The scheme, which has primary, secondary, and tertiary care components, places a great focus on the secondary and tertiary care services and requires more investment in comprehensive primary health care. The potential problems of “profit-motivated” supplier-induced demand by private health care providers and corrupt practices are possible ethical burdens of the scheme. For the Ayushman Bharat to meet the ethical principle of justice, it should first address universal coverage of comprehensive primary health care and move on to hospital insurance in a progressive manner. The scheme should have provisions to strictly regulate secondary and tertiary care hospitalization in the private health sector to prevent misuse. 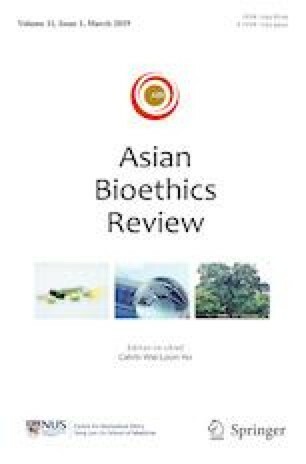 It is the ethical responsibility of the government to ensure a strong and robust public health system, but the current provisioning of the Ayushman Bharat scheme does not do this and the reasons for this are explained in this paper. The author would like to acknowledge the critical inputs of Dr Sudharshini Subramaniam MD, on a previous version of this paper. Bang, Abhay, Mirai Chatterjee, Jashodhra Dasgupta, Anu Garg, Yogesh Jain, A. K. Shiva Kumar, Nachiket Mor, Vinod Paul, P. K. Pradhan, M. Govinda Rao, et al. 2011. High level expert group report on universal health coverage for India. New Delhi. Available from: http://planningcommission.nic.in/reports/genrep/rep_uhc0812.pdf. Accessed 29 Mar 2019. Chokshi, Maulik, B. Patil, R. Khanna, Sutapa Bandyopadhyay Neogi, Jyoti Sharma, V.K. Paul, and Sanjay Zodpey. 2016. Health systems in India. Journal of Perinatology 36 (Suppl 3): S9–S12. https://doi.org/10.1038/jp.2016.184. Dash, U. and V. R. Muraleedharan. 2011. How equitable is employees’ state insurance scheme in India? : a case study of Tamil Nadu. London: Consortium for Research on Equitable Health Systems (CREHS). Available from: http://www.crehs.lshtm.ac.uk/india_esis_12jul.pdf. Accessed 29 Mar 2019. National Health Authority (NHA). 2018. About Pradhan Mantri Jan Aarogya Yojna (PM-JAY). [cited 7 January 2019]. Available from: https://www.pmjay.gov.in/about-pmjay. Accessed 29 Mar 2019.